He was dependent on frequent blood transfusions. A controversial antibiotic used to treat a serious lung infection had destroyed his mountaineer’s sense of balance. Walking, even with a crutch, was difficult and painful. He had signs of prostate cancer. Cardiac decompensation was making him increasingly breathless. He could no longer manage a favourite walk around our village, across the bridge and up and around the steep hill on the other side. Then the wine co-operative was too far. Finally, the fountain near the church became a barely attainable goal. “My body is falling apart,” he said. “The only part of me still working properly is my mind.” He forgot about his eyes and ears, keener than mine. Gerard was 87 when he died and looked a good 10 years younger. His eyes were blue and clear, his thick head of hair the colour and shine of polished steel. He rarely wore anything other than checked shirts and jeans, except the bermudas he got out as soon as the sun was warm enough. He shaved meticulously until he decided to try a fashionable 3mm beard, which suited him. He smelled good. We weren’t a typical couple. When a mutual friend introduced us, Gerard was in his mid-70s and I wasn’t far behind. Both of us had lost our spouses; Gerard through divorce and my husband had died. We had no idea how long we would have together, but were determined to make the most of what we considered a tremendous gift . My companion of almost a decade had two overwhelming fears: becoming seriously dependent in an institution and not being in control of his own life. But he was not afraid of death. He often told me that, if necessary, he would know what to do. Thinking it over seriously, he also realised that a DIY job, as he called it, could be very messy, both for him and, in its fall-out, for me. After talking with his GP, who knew only too well what might be ahead and how much he was at the mercy of the next crisis, Gerard decided it was time to proceed towards assisted suicide. I could only agree. We were living in France where the doctors and hospitals are very good at keeping patients alive in some form or another, but where the very idea of accompanied suicide remains taboo. Gerard decided to contact two of the associations that can arrange for accompanied suicide in Switzerland. And we moved to my family home near Lausanne. A very few countries, and three American states, have legalised some form of accompanied or assisted suicide. All have different regulations. In Switzerland, assisted suicide is not, strictly speaking, positively recognised as such but helping someone to kill himself – without any hint or possibility of self-enrichment – has been decriminalised since the second world war. It seems to me important to define clearly what is meant by euthanasia, either active or passive, and accompanied or assisted suicide (let’s call it AS). The distinctions between them are often blurred, sometimes deliberately. Euthanasia is implemented from the outside, so to speak, by a person other than the subject even when it is done with his approval. It can be benign, for example by increasing dosages of opiates (which might be given in any case), or more obviously active. Passive euthanasia most often implies the withholding of either a vital drug or treatment, or of food, as is sometimes done under the banner of palliative care, where the patient is given water, or otherwise hydrated, and painkillers but no nourishment. A distinctive signature of AS (the terms “assisted” or “accompanied” appear to be interchangeable) is that it requires the active participation of the subject, or patient, who must be of sound mind, capable not only of discernment and a fully conscious personal request, but also of swallowing (or in rare cases injecting himself with) the legally obtained drug that will kill him. 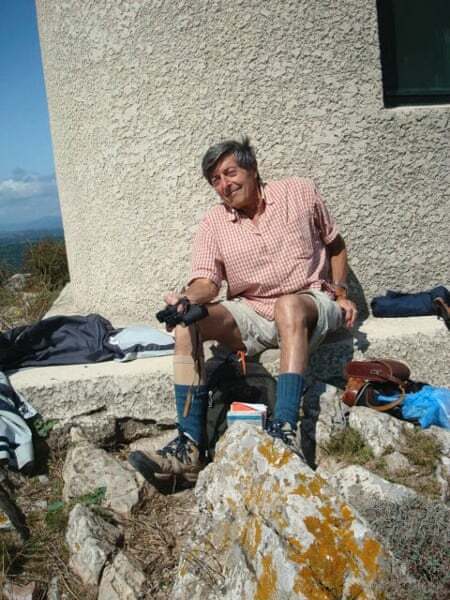 Gerard at the top of a mountain in 2010. For Gerard, after telephone contacts, came the paperwork – lots of it. First was a written request to become a member of one of the AS associations open to non-residents in Switzerland. From that point on, he dealt with one respondent: Carolina, a woman with a voice as agreeable as her manner, was the coordinator for his dossier; she answered questions, helped him over the administrative hurdles and calmed him down when he became impatient with the delays. Joining an association is not the equivalent of asking for AS; many people join simply out of conviction. A separate letter had to be written, formally requesting the association’s help in preparing a suicide for himself. The third requirement was for a detailed autobiography. Several copies of Gerard’s passport were to be deposited, as well as certificates of residence – in his case, of our last permanent home in France as well as of his newly declared secondary residence in Switzerland. We surmised that much of this was a safeguard against possible abuse – variations of the “let’s get rid of grandma syndrome”. We also wondered how someone less articulate and less alert than Gerard could have dealt with it. In the meantime, an additional physical and mental assessment, incorporating the French GP’s report, had to be provided by a doctor practising in Switzerland. Another barrier to impetuous action, in case of lovelorn despair, for example. The most complicated requirement was for an “authentic certified original hard-copy birth certificate”, not more than six months old. Gerard was born in a place that no longer exists: a German city that became Polish at the end of the second world war. All the archives were destroyed and then rewritten, with errors, in Polish. Gerard fulminated: his British passport should have been proof enough of his birth. The whole process was held up for weeks with papers bouncing from one office to another. “If they make any more problems with their bloody certificates, I’ll go back to a DIY solution,” he said. I made it clear that I was not in favour of that idea. I was in a strange situation: trying to calm and comfort Gerard, carrying on with a semblance of normal life, yet wanting the scenario to proceed, knowing that each day carried with it the danger of a new crisis. Eventually, an email copy of the certificate came and was accepted (the paper copy arrived six days after he died). At the end of May, Carolina rang to give Gerard the dates he had been waiting for: two more appointments with the association’s consultant doctor, then the assisted suicide. Gerard was becoming weaker by the day. For the first time he was having difficulty with eating and digestion. He was not bedridden, but he spent more and more time sleeping. The consultant took a good look, and had a long conversation with him – about himself, but even more about current world affairs, in French and English. She ended with: “I don’t think you are going to change your mind, do you?” She told him he could skip the second visit. She wrote the prescription for the operative drug and a waiver whereby Gerard gave permission for a representative of the organisation to collect it at the pharmacy. It would be brought to him by the “escorts”, as they were formally known. Another four days to get through. I tried to make them as normal as possible, even to fill them with some joy. But his fatigue was such that the smallest excursion became problematic. My personal terror – I didn’t dare speak about it – was of another fall that would require hospitalisation. It was his fear, too. He was holding on by sheer willpower. Then came Friday and the midday appointment for Gerard’s final journey. It was a sparkling, sunny day in late spring and he slowly, painfully, meticulously, had a shower, washed his hair, shaved and dressed with a crisp, fresh shirt before breakfast. There was, we saw, enough time for a last (we didn’t say it: last) drive along the lake, looking at his beloved mountains. “How wonderful to leave the world on such a beautiful day!” he said. The email giving details for the day’s schedule stated that he could eat and drink as he wished, do whatever he felt like. We settled in the garden with a bowl of cherries. Bee balm and laburnum were in full bloom. So were the peonies. You could see a sliver of lake; hornbeams and the big copper beech would soon hide it until autumn. Ten minutes before noon, there was a phone call from the escorts (whom Gerard had renamed his avenging angels). They had arrived in our village. Could they come? Schoolmasterish Mr Thommen and pretty Ms Krause arrived, radiating calm. The first thing they said, and repeated, was that Gerard was free to change his mind at any point, with no need for explanations, and that they had all the time in the world. The course of the day was to be entirely decided by him. We ate more cherries and the escorts explained that when he was ready, he could ask for the first draught. This was an anti-emetic, its purpose to ensure there would be no problems with the main potion, whose bitter taste could sometimes induce vomiting. After at least 30 minutes, it would be up to Gerard to ask for the final drug. He could take it wherever he wanted, no need to lie down. Mr Thommen was a recently retired schoolmaster from eastern Switzerland. Ms Krause had begun her professional life as a nurse and then trained as a funeral director; she was familiar with the science (or the art) of dealing with death. The “angels” are part-time volunteers. I brought out some tapas for lunch. Even Gerard tasted one or two and the angels looked quite grateful: they had started out early in the morning from Zurich. No one talked about the next act. No one talked very much at all. At half past one, Gerard said he thought it was time for his first potion. Mr Thommen took out a small vial and offered it to Gerard to drink in a glass of water. The angels went for a walk around the garden. We stayed where we were, savouring the lovely day. Gerard was never a demonstrative man. He certainly was not going to make a drama out of these last moments. We only said once more what an extraordinary piece of luck it had been to find each other. He had decided that his study, with its comfortable sofa, was quite a good place. We went together and I slipped the CD of one of his favourite Dvořàk quartets into the player. Mr Thommen and Ms Krause came in and pushed cushions around. Gerard sat on the sofa. I sat down beside him and he took my hand and kept it, as we had often done at a concert. And he handed Gerard the glass. Gerard thanked him, drank it down and handed it back. The escorts left us. She said that I could remain with Gerard for a little while longer; she would return. She did come back and in her gentle voice said that I could stay but it would probably be easier for me if I said goodbye then. I returned to the garden. My faithful friend Fanny, who had been there all the time, practically invisible, brought out a cup of tea. It was she who rang the police, who answered each quiet ring of the bell as the necessary officials came and went, supplied everyone with tea or lemonade, answered practical questions. The next part went surprisingly smoothly. We had asked our town registry office exactly what the procedure was. (Gerard had been as curious to know it as I. It concerned him, after all.) The gendarmerie was to be called first. They arrived quickly, in civilian dress and an unmarked car. They had already informed both the forensic examiner, who appeared at the same time, and the state prosecutor. The remarkably tactful gendarme had to ask me (and one of the escorts) two pages’ worth of questions; he then rang the prosecutor in my presence to say that everything was in order, that he could release the body. Their last call was to the funeral directors (also alerted, and given their instructions in advance); it was one of the gendarmes who suggested that I return to the garden where I wouldn’t see those gloomy gentlemen going through the house, carrying Gerard out. After that, everyone left. And I heard no more from any of them – except the gendarmes, one of whom rang the same evening to ask kindly whether I was all right. Only Fanny remained to keep me company until evening, when one of my sons came to spend the night. After Gerard died, I received letters and emails from many of our friends. I hadn’t stated clearly how he had died, but quite a few people guessed. Almost unanimously they approved of his decision – and said they hoped they would have the courage to take the same decisions if it ever came to that stage for them. Photo by Felix Clay for the Guardian. Originally published by The Guardian, author Liesl Graz.